Cracked iPhone screen repair and broken iPad glass replacement are the most common repairs we do here at Fixit in Metairie. It takes about 45 minutes, there’s no appointment necessary and our iPhone screen repair service comes with a lifetime warranty. We can fix issues with your iPhone camera, the iPhone volume and power buttons and we even repair or replace your iPhone battery or charging port. On the software side, Fixit offers iPhone data backup and recovery as well. Along with iPhone repair, Fixit specializes in iPad screen repair as well. 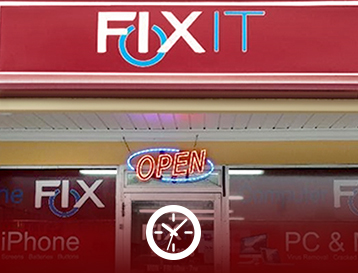 Conveniently located in Metairie, Fixit technicians have repaired thousands of iPads since opening in 2011. If you’re searching for iPad repair services in Kenner, Metairie or New Orleans, Fixit has you covered! We offer a lifetime warranty on all iPad screen repair / replacement services. 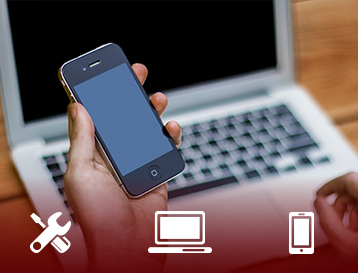 When it comes to your computer or laptop, Fixit offers a wide variety of services. Whether your computer has a virus or is just running slow, Fixit can diagnose the problem and have you back up and running within a day or two in most cases. We even offer same day service on certain repairs. Data backup and recovery are no problem for our highly experienced technicians and neither are cracked laptop screens. Fixit also specializes in Mac repair so don’t hesitate to bring your Macbook Air, Macbook Pro or iMac in for a repair today! At Fixit, we stand behind the high quality parts we use and the work we do. That’s why we offer a lifetime warranty on all of our iPhone cracked screen repair services and iPad cracked glass services.Our highly experienced and friendly technicians have repaired over 55,000 devices since opening in 2011 and we can’t wait to help with yours. Need it done today? Fixit can repair your iPhone cracked screen while you wait and with no hassle! Fixit is here to help. There’s no need to make an appointment, even for cracked iPhone screen repair. Just walk in and we’ll take care of the rest.